Let’s face it… when traveling with six kids it can be tough to find accommodations that work for such a large family. Sure, there have been times when I have booked a standard-sized hotel room and then snuck the “extra” kids through the side door, each one carrying his or her own sleeping bag and pillow. But that option doesn’t work for more than one night… it’s just too crowded (not to mention….their precious faces sleeping on hotel room floors… yuck!). Condos or rental homes often require staying for a full week, which doesn’t always line up with our travel plans. So quite often our best option is to stay in a campground. I would say we are moderately experienced campers. Lord knows we own the equipment! We have two of those instant-up tents that can be set up in under 5 minutes. We have a super-awesome camp stove where my husband can cook up a mean batch of scrambled eggs and sausages while the kids and I sleep in. And of course we have 4 queen-sized air mattresses and 8 sleeping bags, not to mention a couple dozen flashlights and headlamps. But it’s not just having all of the equipment, and it’s not even the budget-stretching bonus of only shelling out $50 for a campsite that makes us love camping. For us it’s all about the family activities and getting-back-to-nature experiences that no hotel can ever match! So when we made our vacation plans to travel up to Lake Placid, New York for the weekend, we specifically looked for a place where we could enjoy some local adventures and then kick back together as a family in the pool, on the playground, around the fire pit, and just have some good old-fashioned fun. For this family, the Lake Placid/Whiteface Mtn. KOA completely fit the bill! We chose KOA family camping during the last weekend of June. The campground was filled with RVs and tents, and there were kids everywhere! My kids range in age from 8-13, and while they generally get along well with one another, it’s always nice when they have the opportunity to make a few new friends while playing ping-pong or engaging in a craft workshop led by the KOA staff. During our visit, kids made masks one afternoon that they then wore to that evening’s “masquerade ball” held on the top floor of the main lodge. And every single KOA we have ever been to has had a giant, over-sized, outdoor chess board that my kids just have to challenge each other on! There was also a mini golf course (only $1 for kids and $2 for adults), basketball, and horseshoes, not to mention a pool perfect for cooling off after a hot afternoon of hiking! The Lake Placid area is a great destination for large families like ours because there are so many activities to enjoy that fit a wide range of ages and interests. We decided to spend one day engaged in nature activities starting with a hike and a picnic lunch at the High Falls Gorge. Here, great trails offered an up-close encounter to the rushing waterfalls and a view of natural “potholes” created by centuries of boulders moving in the churning water to grind out a tube in the rock wall. 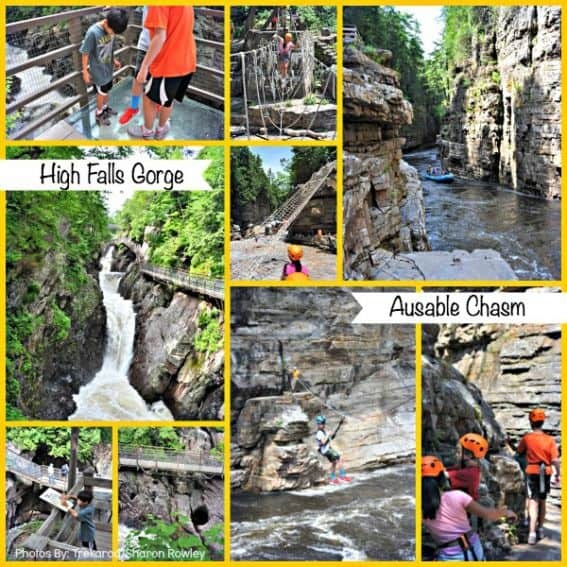 After lunch we headed over to see the Ausable Chasm where we got busy on the Adventure Trail, traversing the river on zip lines, crossing rope bridges, and climbing across the canyon wall on footholds while being securely supported by our climbing harnesses. We followed that up with the Classic Tour, a hike through the chasm to the raft launch area for a 2-mile float trip through the canyon (including a short stint on a set of Class II rapids!). 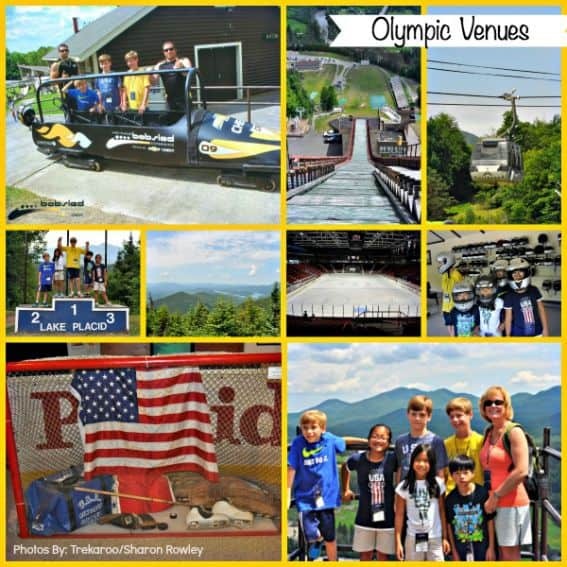 On our second day, we enjoyed a full itinerary of Olympic adventures, including a trip to the top of Little Whiteface Mountain on the Cloudsplitter gondola. A stop at the Olympic ice rink (the site of the 1980 “miracle” hockey match with the US defeating the Russian team before continuing on to win the gold medal game against Finland), and a trip to the top of the 120-meter Olympic ski jumping platform added to our Olympic experience. To cap off our day, we enjoyed a ride on the 1980 Olympic bobsled track (on a sled designed to run on the concrete track) with a professional driver and brakeman! Now truth be told, we decided to mix it up a little bit on the trip, and rather than staying in a tent at the campground, we opted to stay in a rental cabin instead. A little less gear to bring along, a little more pampering for Mom. (A bathroom all to ourselves AND the ability to blow dry my hair won me over!) We even got a little fancy with our camp dinner, preparing Kalbi kebabs using the gas grill on the back deck of the cabin, followed by s’mores in our fire pit. Of course, getting to snuggle up in a comfy bed in an air-conditioned cabin made our camping experience all that much sweeter! Book a vacation with KOA today! 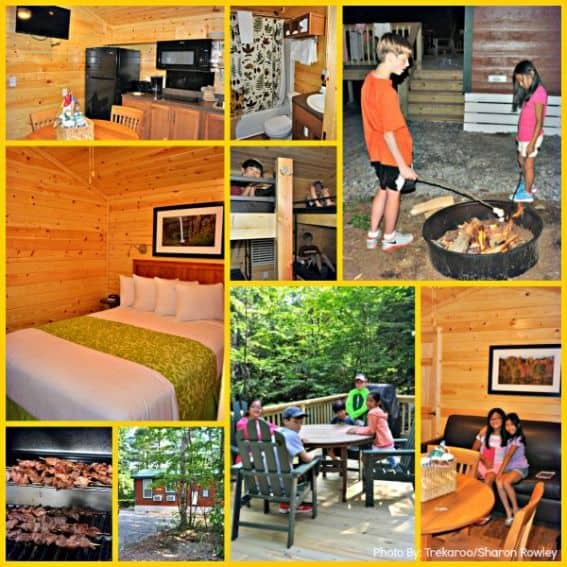 Ready to take a KOA family camping trip? Learn more about “What’s behind the yellow sign?” Head here to read the KOA experiences of other Trekaroo families. Disclosure: The kids and I received a complimentary stay at the Lake Placid/Whiteface Mtn. KOA via Kampgrounds of America. We also received complimentary Olympic sites passports, tour tickets for the Ausable Chasm, and admission to High Falls Gorge. The opinions stated here are my own. This is a sponsored post for Trekaroo. So much to do and so much fun to have. It sounds like an awesome place to go camping and a lot of fun too. Looks like alot of fun! I think big families can bring alot of rewards. There is never a dull moment. I think it is important when you have that many to stay in place that offer a variety of activities to suit everyone needs. It seems like KOA camps provide just that! 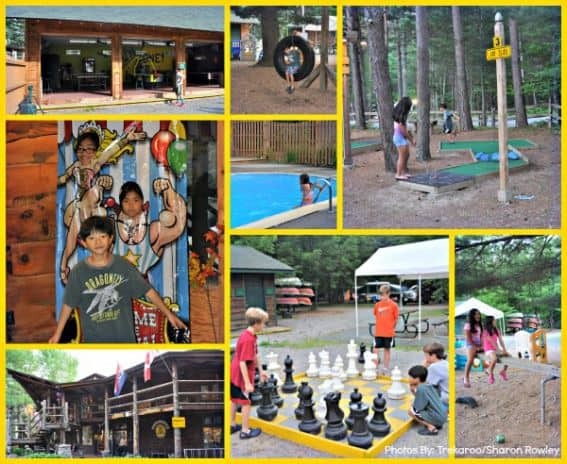 It looks like there are plenty of fun activities for the family at KOA! I love that they have so much to do, it looks like a lot of fun! 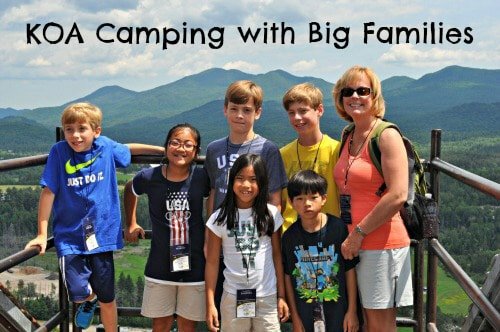 We have 5 kids and camping is definitely the best value for a vacation. I love that they have so many activities!! Marvelous tips! Did a lot of cabin camping when our four were young. These are some really great tips and activities! We don’t have a large family, but it’s still helpful.